Bank welcomes guests from the US and Mexico, makes $2 million contribution to MD Anderson Cancer Center. On Saturday evening, IBC Bank's directors, officers, employees and honored guests celebrated five decades in business at a grand 50th anniversary gala at IBC's main branch on 1200 San Bernardo Avenue. The golden black-tie affair was fittingly held at its corporate headquarters, the same ground where IBC got its start 50 years ago in a mobile home. The bank temporarily converted the four-story bank building into a grand ballroom for the red-carpet gala as distinguished guests from across the United States and Mexico paid tribute to the bank's history. Attendees enjoyed delectable food and drink as they listened to live entertainment on every level. A historical look back through video vignettes and a timeline of the bank's significant milestones were on display for guests to enjoy the past five decades. The bank opened for business in 1966 and began its' exciting journey. Much success came to IBC Bank over the years following its' "We Do More" philosophy. Under IBC Bank's current Chairman of the Board and CEO Dennis E. Nixon, the bank grew from one branch in Laredo to 12 regional markets, including 204 branches serving 88 communities in Texas and Oklahoma. "I am proud to celebrate this historical moment with the IBC Bank community," said Nixon. "So much has changed in the world since I joined the bank in 1975, but many truths remain the same. ‘We Do More' is not only our motto, but it's a timeless way to conduct business. This approach has helped us change thousands of lives as we built the trust that keeps generations of commercial and retail customers coming back to us as their financial partner." Those in attendance at the gala represented the bank's growth and leadership, including Member of the International Bancshares Corporation Board of Directors Leonardo "Lenny" Salinas, who was hired to be one of the bank's original cashiers in 1966. "We used to be called ‘the bank from the other side of the tracks,'" said Leonardo Salinas reflecting back on his 50-year history with IBC. "We have come a long way from the days when we were a small bank…What do you think of us now?" Salinas said with a chuckle. Several other bank leaders from around the state and Oklahoma traveled to Laredo to join the original bankers, shareholders and long-time customers from both sides of the river to take part in the festivities. City, state and international dignitaries also helped make up the "who's who" of Laredo honoring IBC Bank. Also unique to the bank is its employees' involvement in the community. Tales of how IBC "does more" were shared amongst members of chambers, business organizations and other community organizations reflecting on the bank's history. 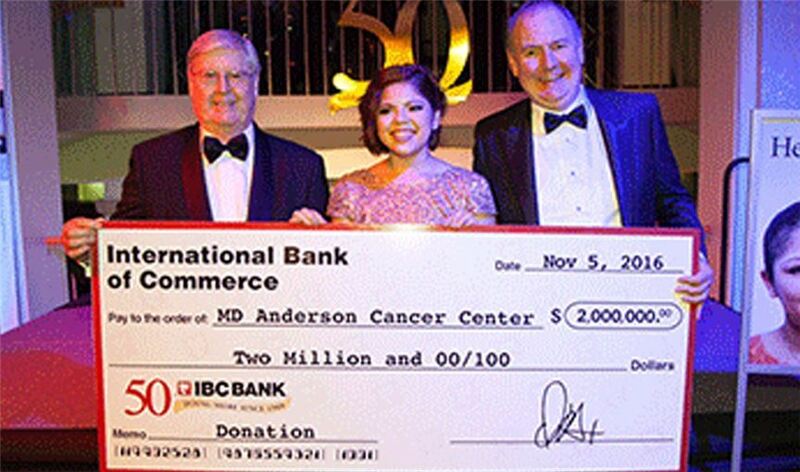 During the gala, IBC Bank announced the fundraising result of its End Cancer Campaign, which began on June 15 in all its branches in Texas and Oklahoma to benefit cancer research at The University of Texas MD Anderson Cancer Center. The community was invited to join the fight to end cancer by making a donation at any IBC Bank location or by donating online. "IBC Bank has been a proud supporter of MD Anderson for many years, so it was a natural fit to invite the communities we serve to become MD Anderson supporters in honor of our anniversary," said Nixon. "As an additional commitment to this cause, IBC Bank matched all customer donations, dollar for dollar. Together, these funds will make a difference in the lives of those touched by this disease." Teen cancer survivor Sabrina Dominguez, face of the MD Anderson fundraising campaign, added significance to the cause. At the young age of 16, Sabrina was diagnosed with medulloblastoma, a type of brain cancer. Sabrina currently is a freshman at Texas A&M University. She took part in the presentation of a check to MD Anderson for $2,000,000 provided by the bank. MD Anderson Executive Vice President and Physician in Chief Dr. Thomas Buchholz accepted the check on behalf of the organization. The evening's gala concluded on a high note encompassing IBC Bank's contribution to the community and its landmark presence in history. IBC Bank and Commerce Bank are members of International Bancshares Corporation (NASDAQ: IBOC), an $11.9 billion multi-bank financial holding company headquartered in Laredo, Texas celebrating 50 years in banking since its founding in 1966. International Bancshares Corporation consists of 204 facilities and 309 ATMs serving 88 communities in Texas and Oklahoma. In 2016, IBC Bank was ranked 50th on Forbes' prestigious list of 100 Best Banks in America. IBC Bank's commitment to "Do More" reflects the bank's dedication to the growth and success of both the customers and the communities it serves. Visit us on our YouTube channel, http://www.sec.gov/edgar.shtml. MEMBER FDIC / INTERNATIONAL BANCSHARES CORPORATION. More information is available at ibc.com.